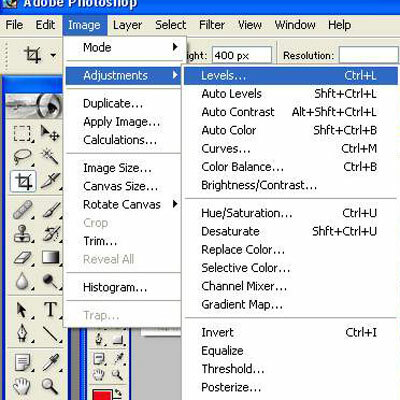 This is a Photoshop 7.0 tutorial, but the steps are valid for newer versions as well. 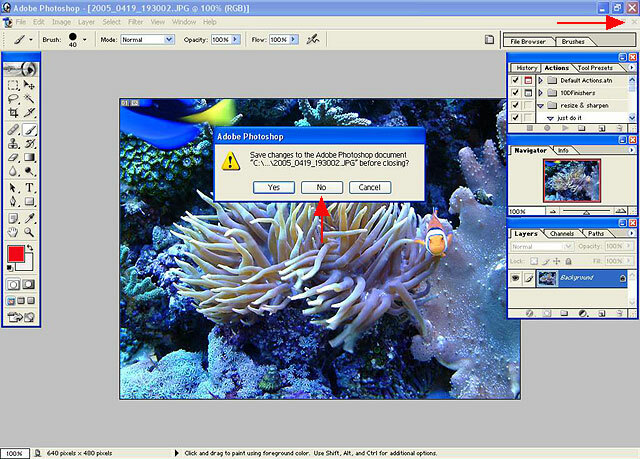 Using Photoshop to clean up our digital (or scanned) images is completely warranted. Don't let others convince you that "photoshopping" is cheating; we aren't trying to misrepresent our subject - we want to make it look as good as possible. Or match it to what we see with our own eyes. The biggest compliment I ever received was when someone visited my home to see my reef, and said the corals looked like my pictures. That's the goal. These steps that I use aren't hard to learn, so take a few minutes to read over them, and bookmark it so you can refer to it later. 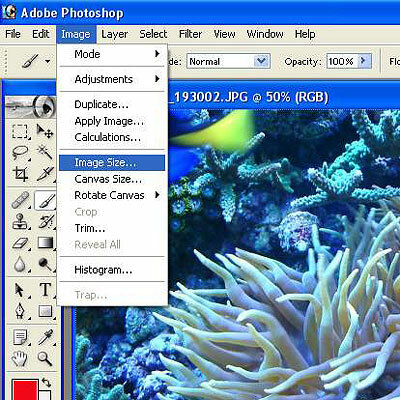 It takes about a minute or so to clean up each image, depending to what extent you are correcting. Spot removal can take quite a bit of time, for example. 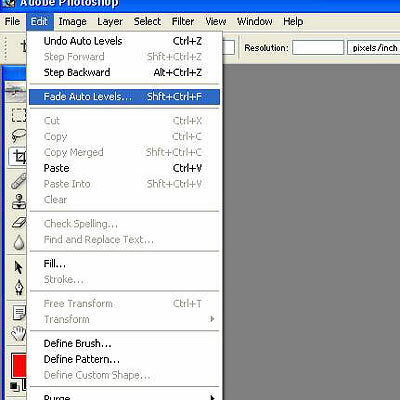 First, load an image in Photoshop. Click Open, and Browse to the file you want to edit. I resize before editing. This is a simple resize, not using the crop tool to cut off any unwanted portions. 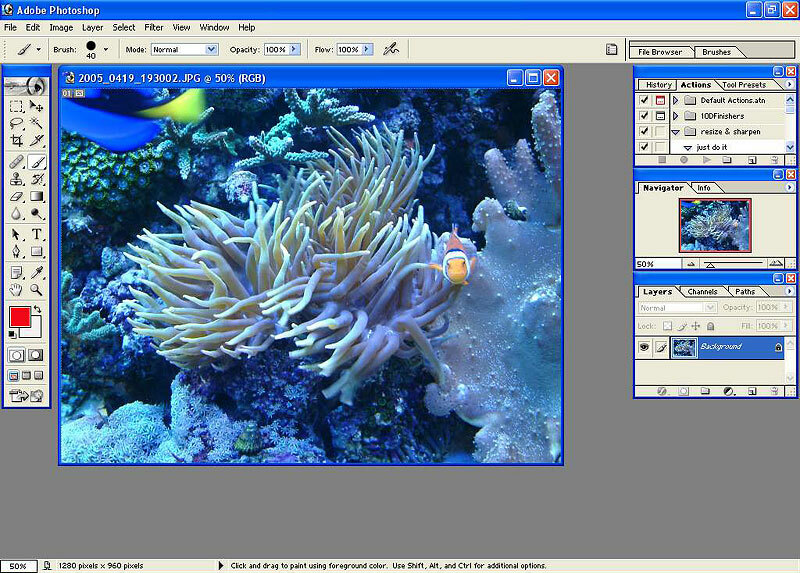 800 x 600 or 640 x 480 are good sizes in general. 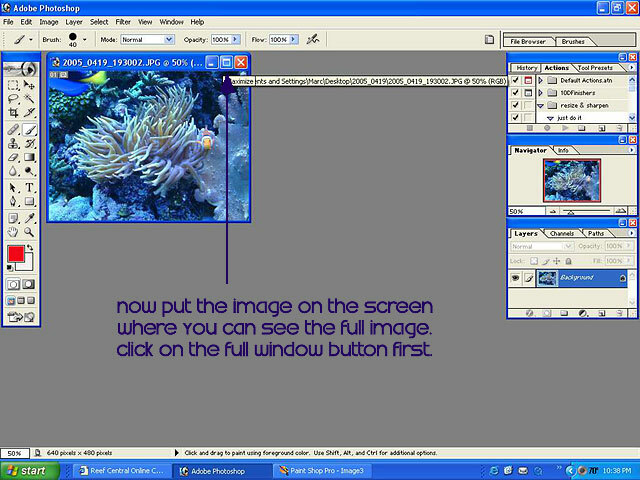 In the above window, when entering Width, Height is automatically entered to keep the image true to shape. 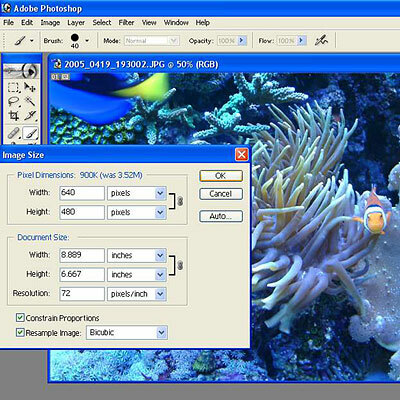 The image is now not only resized smaller (pixels listed in bottom left corner), but also reduced to 50% of its size visually. 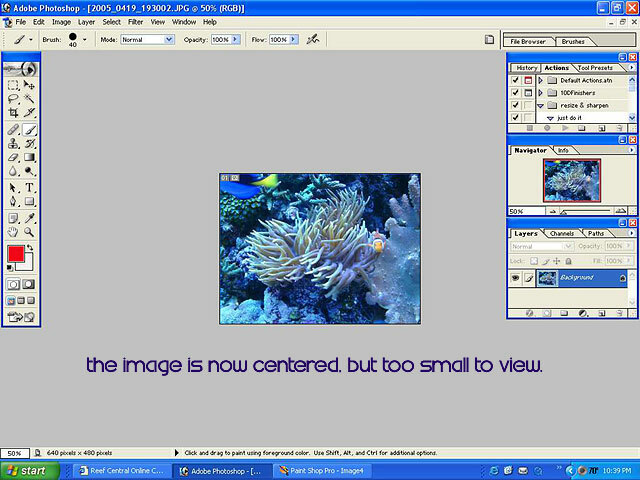 By opening to "full window" you don't see any other images you may have open in the background, and the image you are working on will be centered. By clicking on the 'mountains,' the image size increases. 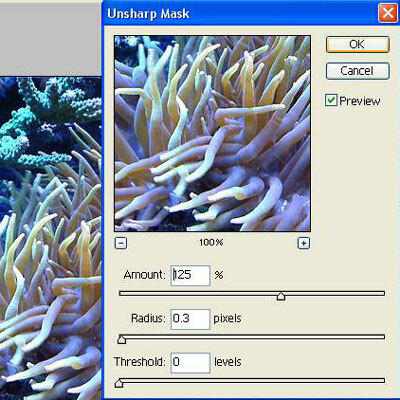 Clicking on the other end of that scale will reduce the image size on your screen. This does not resize the image, only changes your viewing size. Now it is ready for the next step. 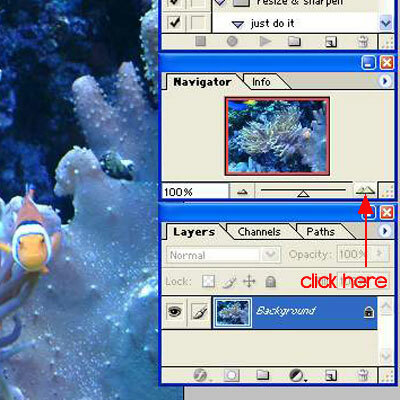 If you want to see all of your image, press the TAB key on your keyboard to hide the extra control panels. Press it again to bring it back. 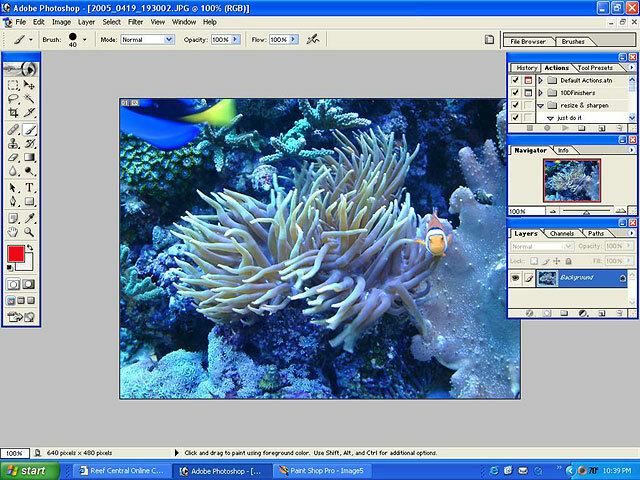 Sometimes you may need to increase the view of your picture to 200% or 400%, and pressing TAB will give you full view of your image or work area. 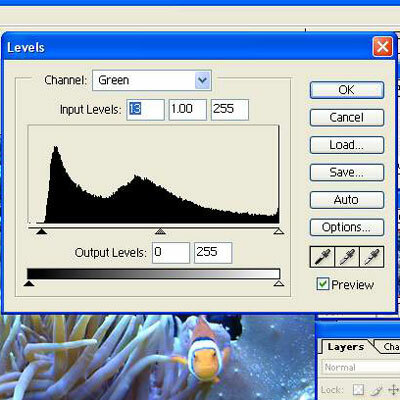 Using Auto Levels will quickly fix the colors of your image. This is a very simplistic solution, that works in some cases but not in others. If the image looks horrible, you can Fade the Auto Levels somewhat, bringing it back to something more realistic looking. 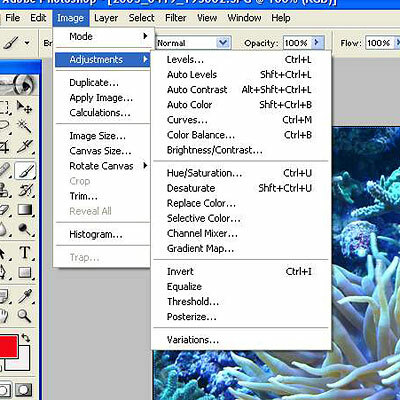 If I use Auto Levels, I may Fade the correction between 70% and 80%. This is determined on a case by case basis. 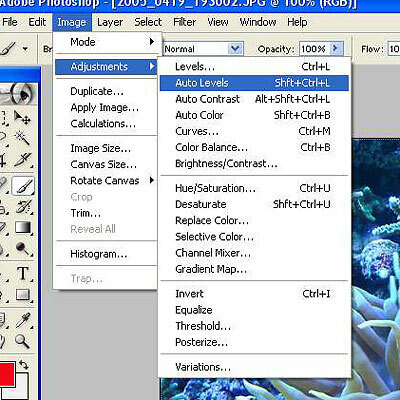 Manual Levels adjustments will produce better control of the image being edited. 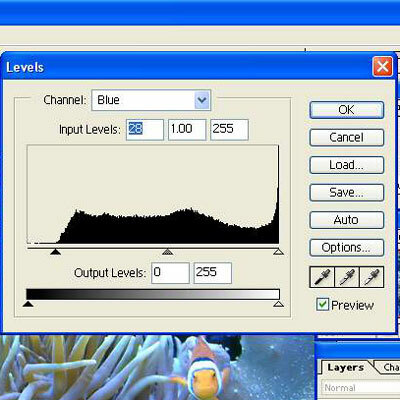 Clicking on Levels will bring up this window. 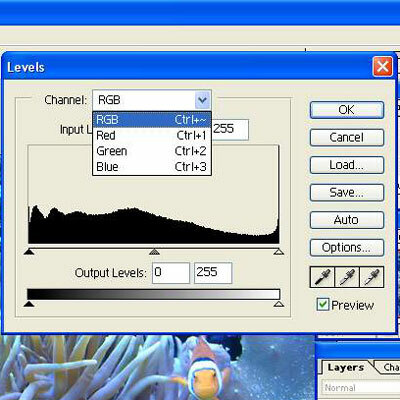 Now you have a histogram of your image, first in RGB(above), then Red, Green and finally Blue. 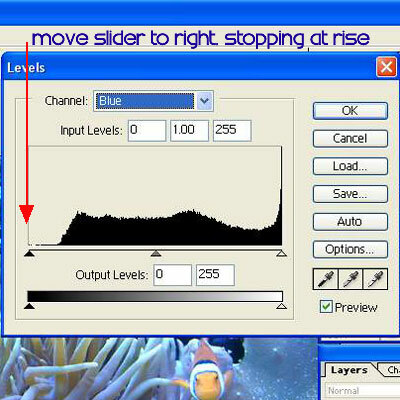 Notice in the Blue histogram, there is a flattened spot. 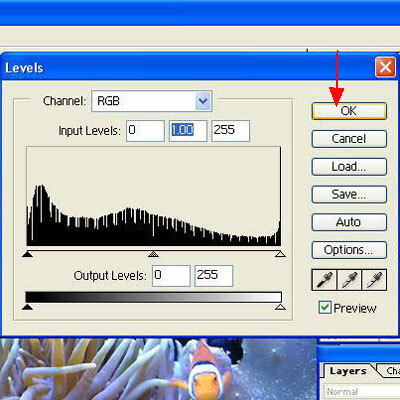 Move the slider over to the beginning of the rise in the histogram to remove some excess blue in your image. If you have the Preview box checked off (as above) you'll see the change immediately in the image. You can uncheck and recheck the box repeatedly to see the changes you are causing and note by comparison. Here is where I would put that little slider. Next, the Green histogram has been adjusted, again moving the left slider. 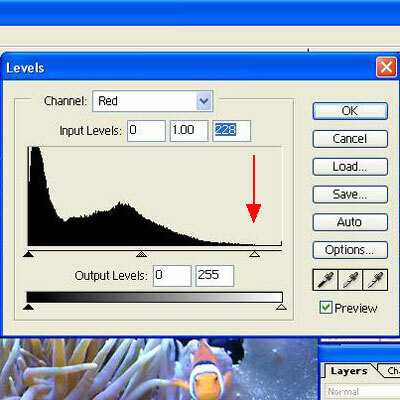 This time the slider on the right in the Red histogram had to be moved. Click on OK. Don't worry, if you hate how it came out, you can go to Edit, then Undo (or Step Backward) to undo what you just did, and try anew. 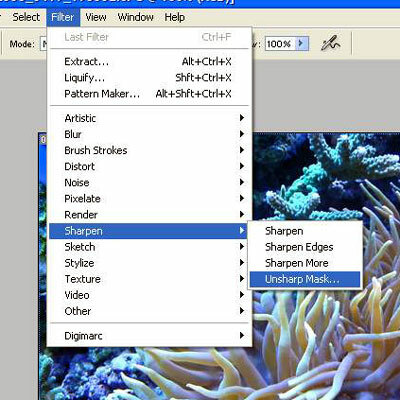 To sharpen an image, I use UnSharp Mask. It sounds backwards, but works beautifully. My settings are almost always 125%, 0.3, and 0. The higher the Radius, the lower the Amount (%) should be used. I almost never change the radius, only adjusting the percent of Amount as needed. After clicking OK, if you have to Unsharp Mask again, you can do so with decent results. Or click on Edit, Undo, and try again. I always save my files as filename.jpg - the larger the filesize, the less people can download it per month due to bandwidth constraints. If you can keep your images between 80k and 150k, you should be okay. Some of the images on this page are only 40k, while a couple are 160k. 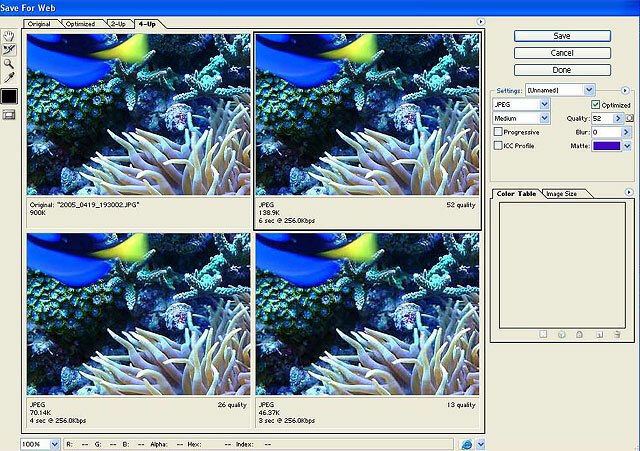 Smaller images (pixel-wise) save to a smaller filesize. 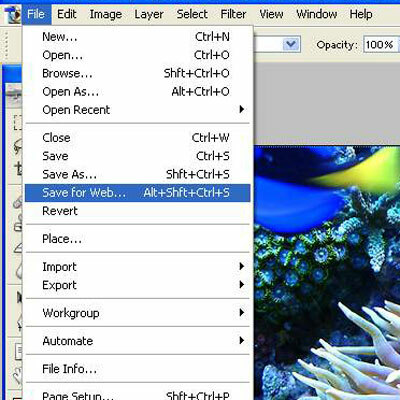 By using Save For Web, you get the option of several sizes. Above, the top left would be 900k! Top right is 138k, at 52 quality. Bottom left is 80k at 26 quality, and finally bottom right is 46k at 13 quality. To be honest, anything under 52 quality starts looking pretty bad to me, for an online viewable image. I like 60 quality, which you can select by either typing it in the Quality box above, or by simply changing the Medium setting to High (left of Quality). 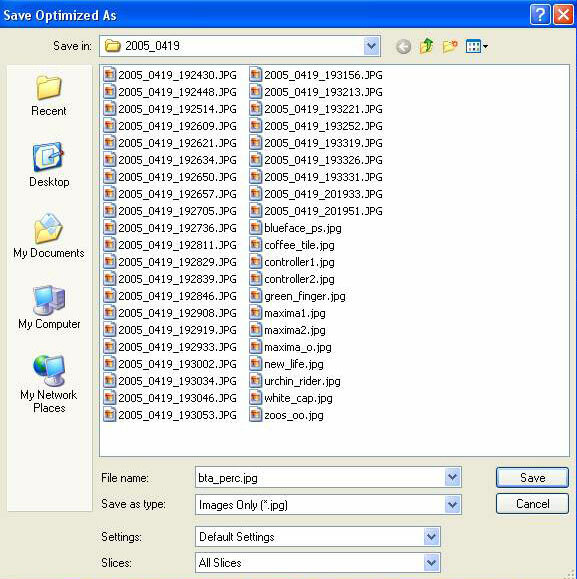 Name your file something you can easily identify, and Save. It is now ready to upload and share with the world. Finally, click on the X (red arrow, top right, pointing to a shaded-out X) to close the original image. Click on NO to leave the original unchanged in case you ever need it again in the future. I never alter my originals, that way if I desire to print it out, the full file size and DPI levels are available for my use. 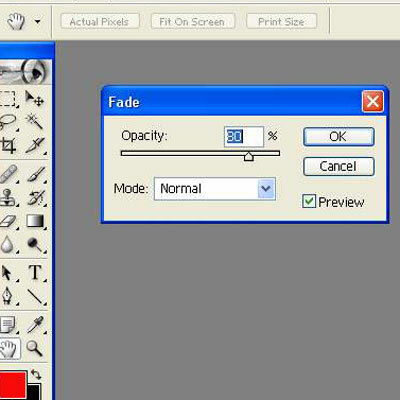 If more images are loaded in Photoshop, I would now repeat this same process with each image until done. And here is the final web-ready image. Ready to try this yourself? 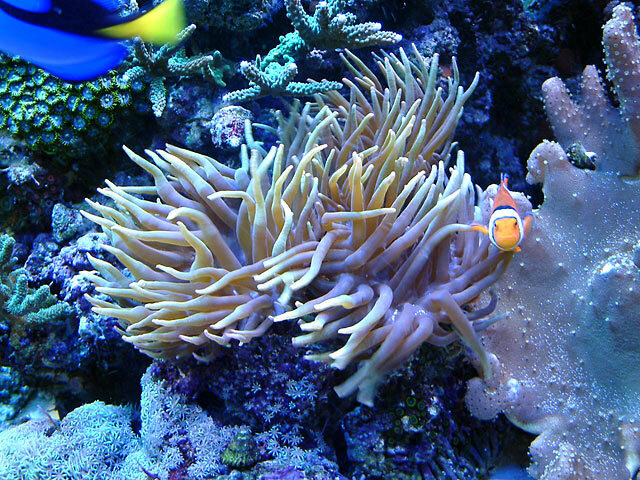 Courtesy Marc Levenson melevsreef.com and reefaddicts.com, used by permission.